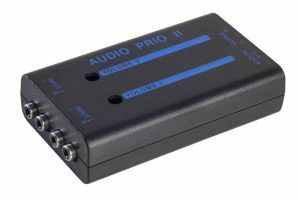 The Fallguy Audio PRIO 2 Inputs Box (Article No.0157) can be connected to two audio sources. The first audio source is treated prioritized. If a signal is played back on this input, any signal present on the second input will fade out and fade in after the first signal has been played. All inputs and outputs have line levels. The input signals can be adjusted via two volume potentiometers.